There’s a much better approach: self-publishing and learning the basics of marketing to sell your book to the right audience. As an added bonus, you’ll know each and everyone of your readers and can build a strong relationship with them—which is awesome for you as you can fine-tune your book to reader’s needs and for your readers because they feel there’s an actual human being there listening to them. To achieve this, you have to keep your costs low and your profit margin high. It’s no good to sell many copies with almost no profit, as the market for highly specialized books is limited. Rule #1: No publishers. Publish the book yourself. Rule #2: No 3rd-party sales channels. No Amazon/Kindle, iBookstore, etc. Rule #3: No DRM. DRM has never stopped anyone from pirating stuff. Rule #4: Publish as a PDF. Optionally also as EPUB, depending on topic/audience. No dead-tree version, please. Rule #5: Price high. Price for the value you provide, not for what feels right. No publishers obviously cuts out the middleman. Of course, you’ll have to learn how to market your book—you can’t just sit there and wait for people to come. You might say, “But Thomas, you have a billion followers on the interwebs, your stuff sells by itself!”—I’m hearing this all the time, but being “internet famous” (in a very small circle) isn’t going to sell your book. I have to work on getting the marketing right just as hard as anyone else does. For ebooks like this, email lists work well. For people to trust their email address to a stranger (you), you’ll need to give them something useful in return—for example, a coupon code to get the book cheaper, free chapters or weekly tips and tricks. Email marketing done right is a bit of work, but it will pay for itself. And if you don’t market, you won’t sell. Additional things you should do is try to land interviews and guest blog posts on blogs relevant to your topic. For Retinafy, I’ve built initial interest by giving away a Retinafying flowchart for free (the flowchart was downloaded almost 100,000 times), and I sent out approximately weekly emails to the list of people that signed up to be informed about the book, each with a little tidbit and reason why retinafying is important and necessary, why the book will make it super easy, and a quote from a reader (collect those!). Once you figure out the price (you need to set the price first, and remember to not base your price on what feels right, see #5), to be profitable and worth your time, you should calculate what you want your minimum hourly rate to be. 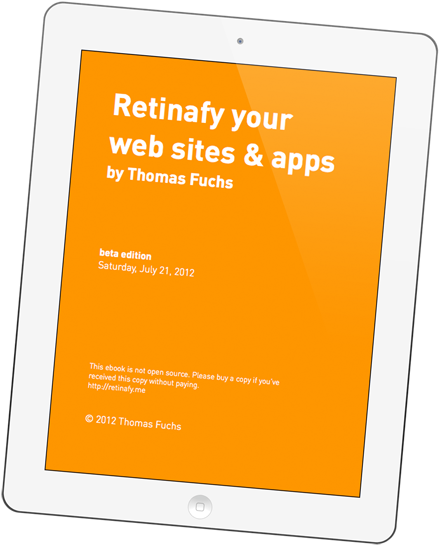 For example, Retinafy took me about 50 hours of research and writing, and maybe another 30 hours of marketing. As of today, October 20 2012, I’ve sold 1088 copies, for a total sale amount of $22,393. For PayPal, you can assume that you’ll end up paying 5% or so in fees, so the profit so far is about $21,300, give or take a few. This makes my hourly rate when working on the book $266.25, and this is only going to increase with more sales. No DRM (rule #3) is a no-brainer. It makes it harder for you and for your readers, breaks things, is ugly and most importantly never stopped anyone from pirating. Don’t bother. Anyway, this how you can sell a book yourself, provide tremendous value to people—and make a tidy profit. P.S. Want to discuss? Here’s the hacker news thread.